I first read Girl Overboard by Justina Chen Headley when I was a freshman in high school. 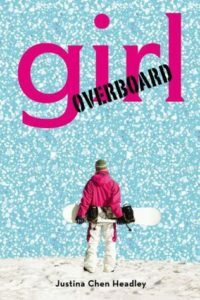 I was a huge fan of Meg Cabot and the Princess Diaries series, and my librarian recommended I give Girl Overboard a try as well. The teen protagonist, Syrah Chang, is another “poor little rich girl” — her father is a wealthy businessman, she wants for nothing, and she’s a champion snowboarder. At the start of the novel, she has it all: all the luxuries and comforts that money can buy, a boyfriend who shares similar interests and a burgeoning snowboarding career. Then, she has a serious accident on the slopes and needs surgery, and her life seems to implode. All of her half-siblings seem to tolerate her (at best), her parents are financially-available but closed off and absent in every other way and her best friend is occupied with her new boyfriend, leaving very little time for Syrah. During all of her ups and downs, and trying to get her snowboarding career back on track while dealing with (a lot) of personal drama, Syrah comes to find that you can plan all you want, but that those plans can be thrown out the window at a moment’s notice. This book is great and captures all of the many hallmarks of “teen lit:” relationships, family drama, sports, stress about the future and so on. Even though Syrah’s financial situation was quite a bit different from my own (my parents are not billionaires, unfortunately!) I still could relate to her when I read the book in high school. We were close to the same age, both in high school and both dealing with the same problems.